How do Amish harvest ice? Arthur Bolduc recently joined a crew for a day of ice-cutting in Knox County, Ohio to give an inside look into the process. 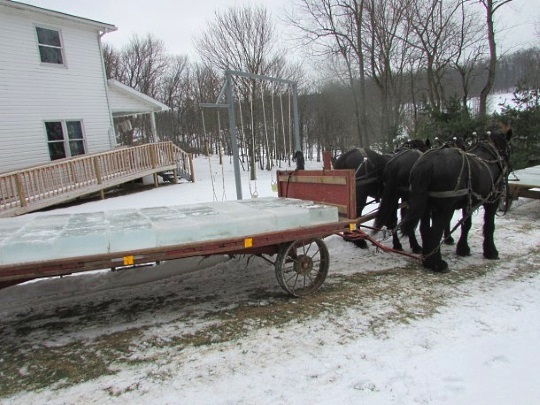 Ice is a necessity for those Amish who don’t use mechanical refrigeration, relying instead on ice houses. But the way they get their ice varies. Amish in Geauga County, for instance, purchase ice stored in ice vending stations scattered throughout the community. Others, like those in this story, or in this Wisconsin community, gather it themselves from frozen ponds. In Bolduc’s story, Amish gathered at the Dennis Miller farm pond for the frolic, where ice had reached a thickness of up to seven inches. The article is a very interesting look into the odd Amish “harvest” that doesn’t involve crops. Bolduc describes it as a “near carnival atmosphere” with women bringing hot drink and doughnuts and “friendly competition” of sliding ice cakes across the frozen surface. Sounds like a fun day if you don’t mind the subzero cold. 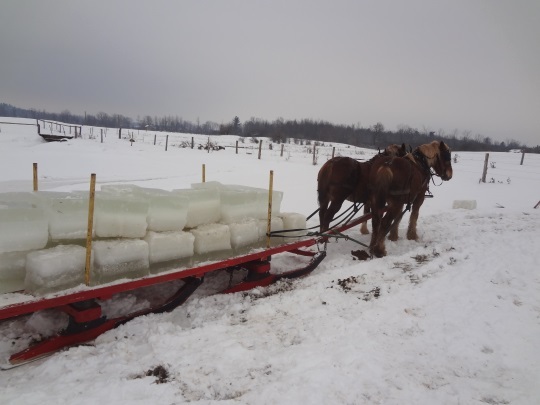 Update: Karen Johnson-Weiner shares two photos of an ice harvest in the Heuvelton, New York area (home to a very conservative Amish community). 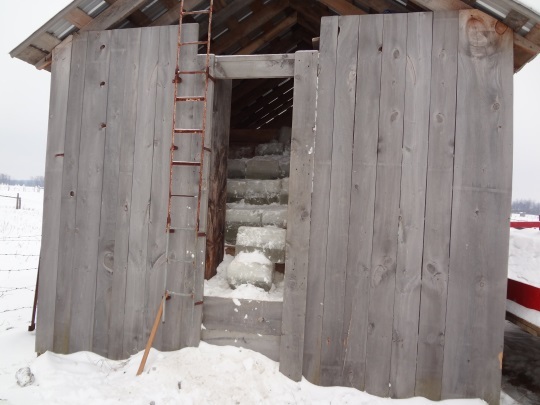 The ice house appears to be of wood construction, at least partially. And the ice blocks seem a good bit thicker than the ones in the photo above. Harvesting ice is like thrashing wheat and oats. It takes the neighborhood and the men get fed well. While I lived in Ontario maybe half a dozen ice houses were scattered around in the community on various farms. Whoever had a share in the ice house helped fill that specific ice house, then get the benefit of that ice in the summertime. Thanks Karen and Katie for a few more ice harvest details. I have updated the post above with two photos Karen shares from the ice harvest in Heuvelton, NY. When I lived the western suburbs of Chicago, Illinois I would take my children to an 1800’s restored farm. Every January they would take the draft horses and hook them up to a wagon and go to the nearby pond and cut ice with hand saws. They stored the ice in the ground(dug to about 8-10 feet) and packed the ice in straw. The ice would be used all year long to cool the milk drawn from the cows to keep fresh until it was delivered to the city. They also used the ice to make ice cream in the Summer. It is not Amish, but they lived very simply like today’s Amish. The following is an article from the Daily Herald news paper. Some cut a hole in it and fish through it, some skate on it, some use it to serve drinks “on the rocks,” others salt it in the hopes it will melt away. Ice has a mixed-bag of a reputation, but back in the days before modern refrigeration units were available, it was seen in its most positive light as a way to preserve food. So when Old Man Winter produced a prodigious amount of the stuff back in the 19th century, people would collect it and store it, much like vegetable or grain crops. “It was very common in the 1800s – people would go out and harvest ice in the wintertime,” said Chris Gingrich, a heritage interpreter at Kline Creek Farm in Winfield. Ice was essential, he said, for family food supplies and for getting milk safely from dairy farms to consumers. Ice blocks would keep food chilled in the kitchen icebox, Gingrich said. They would also be placed in water-filled basins where cans of just-produced cows’ milk would be kept until it was time to take the milk to market or to a creamery for pasteurization, bottling and cheese or butter-making. Roughly 12 tons of ice will be extracted, block by frosty block, from Timber Lake, south of Kline Creek Farm, over the course of four January days beginning next week. 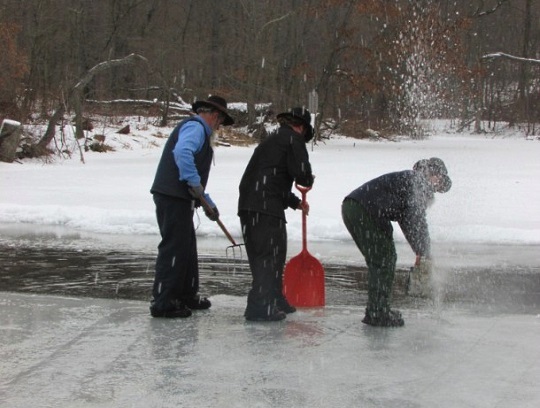 Visitors at the living history, working farm, where life in the 1800s is re-created year-round, will see farm staff and volunteers harvest ice – and they’ll have a chance to try it themselves. Gingrich said blocks that weigh from 70 to 100 pounds each will be cut from the lake, provided the water is frozen, using 1800s-era hand saws. The ice blocks are pulled up a ramp and hoisted onto a horse-drawn wagon using a pulley, he said. Then it’s carted across the grounds. The ice is placed in tubs and covered in straw to slow melting. It works well. “What we harvested in January, we still had ice in September,” he said, adding that that’s with only half the ice house filled. “If we had filled our ice house to capacity,” he said, the supply would likely last all year, summer heat and humidity notwithstanding. “You do lose some from melting,” he said, but the combination of below-ground storage, shade and a light- and a heat-reflecting white coat of paint on the ice house minimizes melting. Gingrich said the ice from Timber Lake will be harvested no matter what the weather, unless temperatures dip dangerously low. Thanks for sharing Jeff. Like water, ice is a “free” resource we take for granted, except it’s not really free at all, is it? And as the articles describe you have to harvest it at the right time and you might miss your chance if conditions are not right. I was also struck by the estimated value of the ice they removed mentioned in the story I linked above. It’s not apples to apples, but if I pay 3 or 4 bucks for a 20-lb bag at my local convenience store, and a single ton contains 100 of those bags, you can see how it would add up. A couple of thoughts on ice and the Amish. When I visited an Amish family in the Riceville, Iowa, settlement about ten years ago, they showed me their ice house which looked similar to the wooden one in the last picture of this post. Also about ten years ago, I remember stopping at an Amish greenhouse in Daviess, Co., Indiana. The proprietor was very friendly and told me during my stop there that he also was the settlement’s main “ice man” and made regular trips to an ice company in Louisville, Ky. to pick up a truck load of ice (with a non-Amish driver). He said that he delivered it to Amish who used ice in their refrigerators/ice boxes. That surprised me because I would have thought all Daviess Co. Amish probably used gas refrigerators. That surprises me too Al. When I was in that community my eye for Amish things was not as honed as it is today (this also would have been about ten years ago). But Daviess County has an interesting history as a mix of Swiss and PA Dutch ethnicity Amish. I’d have to check the date but I believe it was sometime in the early 1990s when they first accepted closed-top buggies and now they are everywhere there.